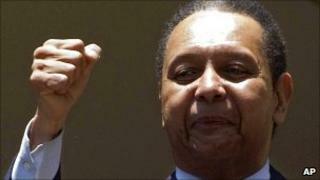 Former Haitian leader Jean-Claude "Baby Doc" Duvalier is being sued for torture and other crimes against humanity, days after his surprise return to the country after 25 years in exile. A lawsuit was filed by a former United Nations spokeswoman, Michele Montas, and three Haitians who were jailed during Mr Duvalier's 1971-1986 rule. It comes a day after state prosecutors charged him with corruption and embezzlement. The ex-leader has denied wrongdoing. "We have just filed the criminal complaints for crimes against humanity with the government prosecutor," Ms Montas told the AFP news agency. "We have lodged lawsuits for arbitrary detention, exile, destruction of private property, torture and moral violation of civil and political rights." Ms Montas is a prominent Haitian activist and journalist, as well as a former spokeswoman for UN secretary-general Ban Ki-moon. The suit comes a day after state prosecutors charged Mr Duvalier with theft and misappropriation of funds during his time as president-for-life. Mr Duvalier, 59, was allowed to go free after questioning on Tuesday, but a judge will decide whether his case goes to trial. One of his lawyers said he was planning to stay in Haiti despite the charges, and might also get involved in politics. "It is his right to live in his country. He is going to stay," the lawyer, Reynold Georges, told the Associated Press. The new lawsuit follows growing calls from international human rights groups for Mr Duvalier to face justice for the alleged torture and murder of thousands of Haitians. Jean-Claude Duvalier was just 19 when he inherited the title of president-for-life from his father, Francois "Papa Doc" Duvalier, who had ruled Haiti since 1957. In 1986 he was forced from power by a popular uprising and US diplomatic pressure, and went into exile in France. His surprise return to the country on Sunday after 25 years has shocked many Haitians. He said he had "come to help" after last year's devastating earthquake. He arrived on the day Haiti was supposed to hold a second round of elections to choose a successor to outgoing President Rene Preval. That vote has been postponed because of a dispute over which candidates should be on the ballot paper. Provisional results from the first round on 28 November provoked violent demonstrations when they were announced, and most observers said there was widespread fraud and intimidation. On Tuesday the UN - which has a large peacekeeping mission in Haiti - said it was a source of concern to see Mr Duvalier resurfacing at a critical time for the stability of the country. Another former Haitian leader - the first democratically elected President, Jean-Bertrand Aristide - has said he is also ready to return home from exile. Mr Aristide has been living in South Africa since he was forced from office in 2004 by an armed revolt and what he says was pressure from the US and France. "Since my forced arrival in the mother continent six-and-a-half years ago, the people of Haiti have never stopped calling for my return to Haiti," he said in a statement sent to the AFP news agency. "As far as I am concerned, I am ready. Once again I express my readiness to leave today, tomorrow, at any time," he added. Unlike Mr Duvalier, Mr Aristide maintains substantial support in Haiti, although his party, Fanmi Lavalas, was excluded from the recent elections for what officials said were technical reasons. A former radical priest who campaigned for democracy during the Duvalier years, he was first elected president in 1990, but overthrown in a coup months later. In 1994 he was reinstated with the support of US troops, but was forbidden by the constitution from standing for a second consecutive term in 1995, leaving his then-ally, Rene Preval, to stand successfully in his stead. In 2000 Mr Aristide was reelected in a poll that was boycotted by most opposition parties, only to be forced from office again in 2004. Are you in Haiti? What's your reaction to this latest development? You can send us your comments using the form below.